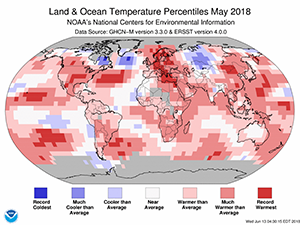 Today NASA and NOAA both released their monthly global climate summaries for May 2018. Both of them, using related data sets with different analysis techniques, show that this past May was the 4th warmest on record for each of the data sets. The warmest year was 2016 when the last El Niño was in full force in the Eastern Pacific Ocean. You can read the NOAA report at https://www.ncei.noaa.gov/news/global-climate-201805. The NASA report is at https://data.giss.nasa.gov/gistemp/news/20180618/.